The entrance is located a couple hundred yards south of the Colosseum along Via di San Gregorio, and guaranteed to feature a tenth or less of the crowds you’ll find swarming the Colosseum area. We spent under ten minutes in line to buy our combo tickets (Roman Forum, Palatine Hill, and Colosseum for 12 euros a person, a real bargain). After a cursory bag check we were inside and immediately transported to ancient Rome. Well, not literally, of course, but you do get a sense of timelessness and an aura or vibe that feels different from being out on the street in the midst of the traffic and urban noise of everyday life. 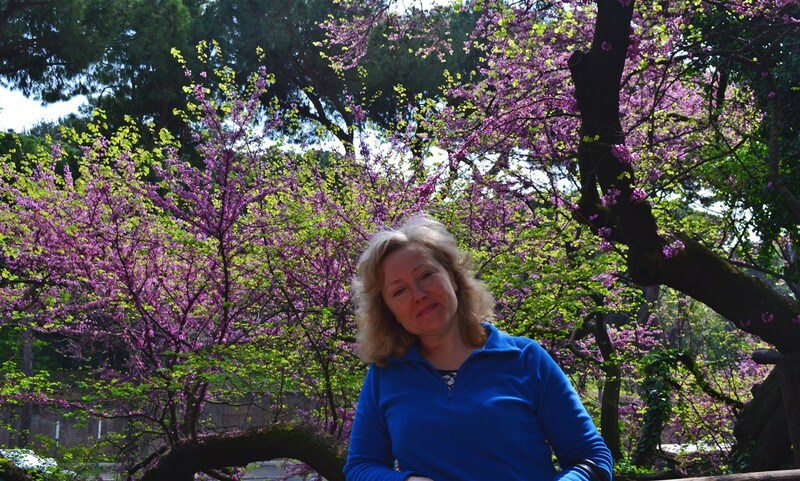 As I said earlier, Palatine Hill is a quiet, shady, peaceful area (something you don’t find a lot of in Rome) with plenty of ruins to wander through. 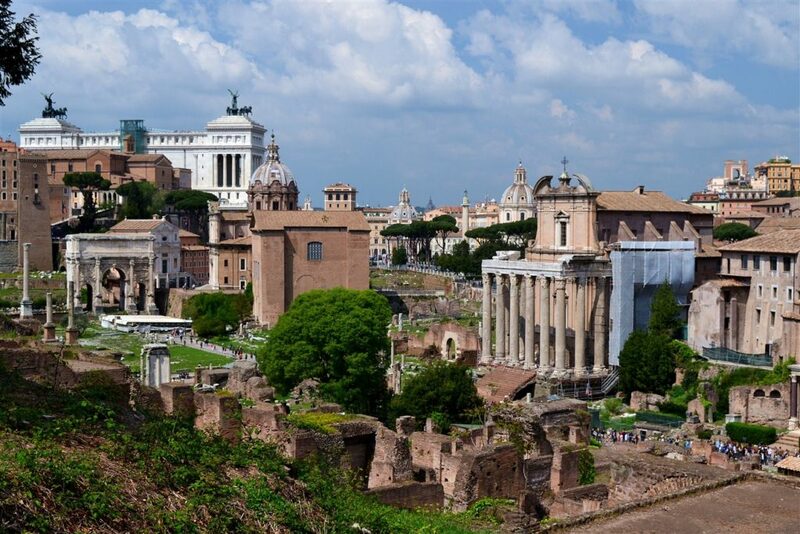 The centermost of the Seven Hills of Rome, and one of the most ancient parts of the city, Palatine Hill stands 40 meters above the Roman Forum, affording a spectacular view looking down upon it. Excavations show that people have lived in the area since the 10th century B.C. 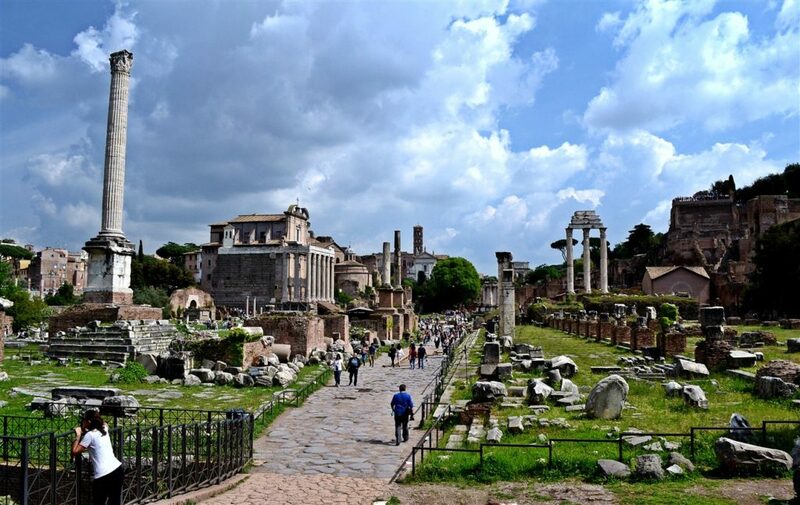 Many affluent Romans of the Republican period (c.509 BC – 44 BC) had their residences here. 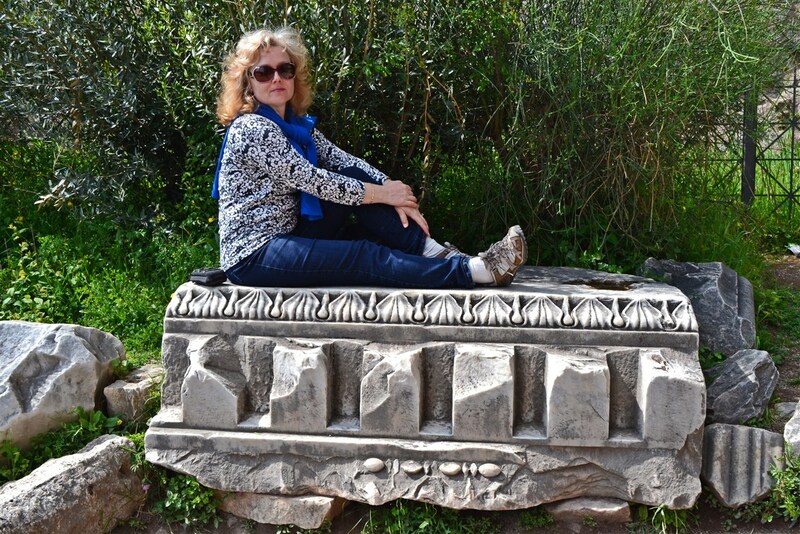 After the first Emperor, Augustus, built his palace there, the hill gradually became the exclusive domain of emperors. 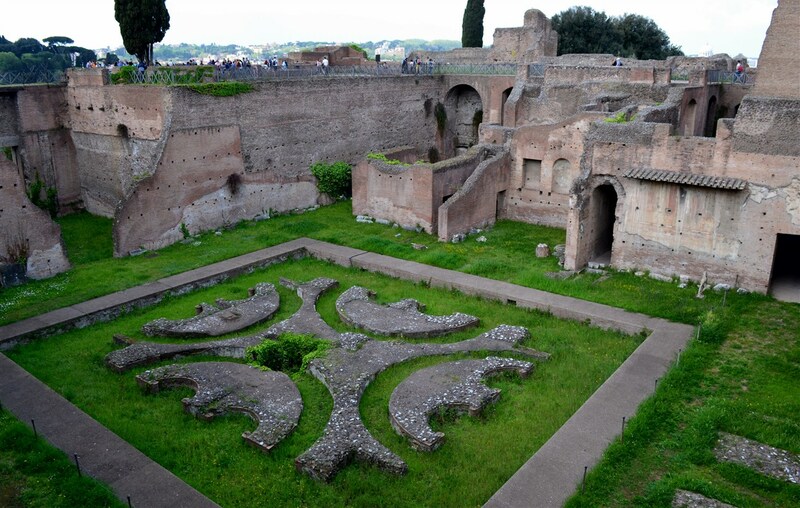 The ruins of the palaces of Augustus (27 BC – 14 AD), Tiberius (14 – 37 AD) and Domitian (81 – 96 AD) can still be seen. 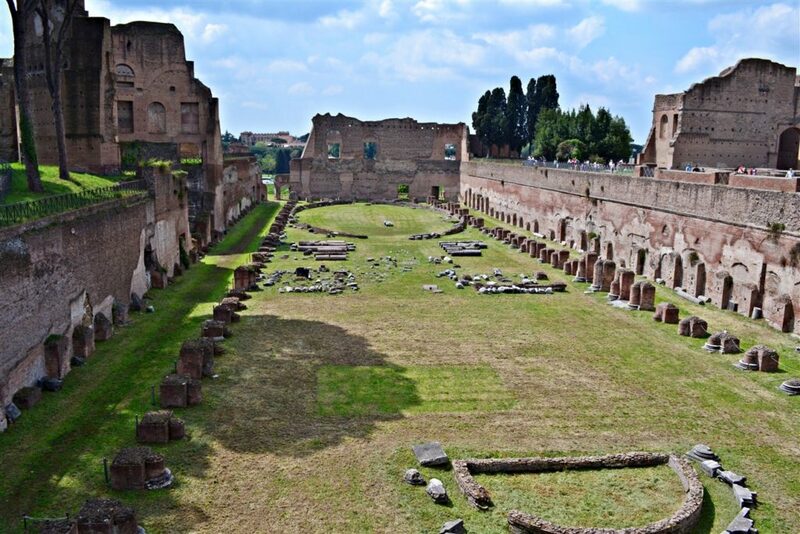 In fact, the word palace is derived from Palatine. One thing you quickly discover is the Romans were great at recycling both materials and sites. One emperor or noble would succeed another and build right on top of what was there before. If something was salvageable or still usable it would be incorporated into a new structure. Archeologically speaking, it must be a nightmare trying to separate and discern what portion of each ruin comes from which era, but they seem to have done a good job of sorting most of it out and labeling it for the masses of visitors to understand. 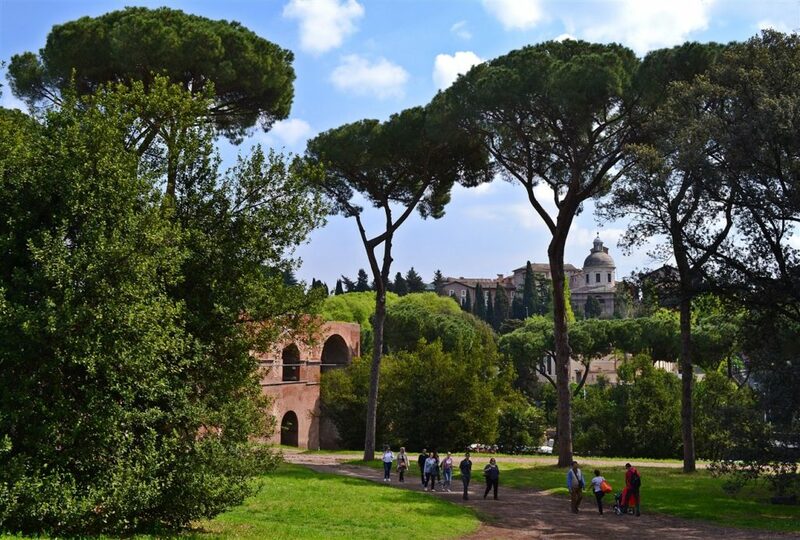 We found it a pleasure to simply take our time and wander the hill, learning some history while enjoying the greenery and relative lack of crowds, making Palatine Hill my favorite place we visited in Rome. 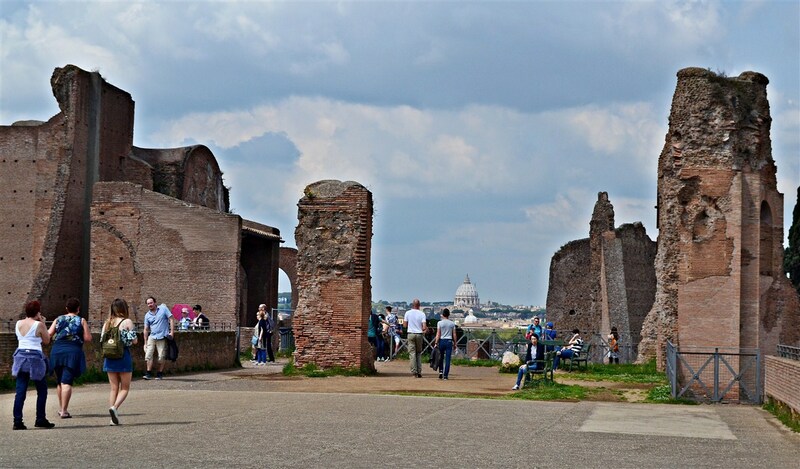 Once we’d finished roaming Palatine Hill, we found easy access to the Roman Forum down a lengthy series of staircases on the north side of the hill. 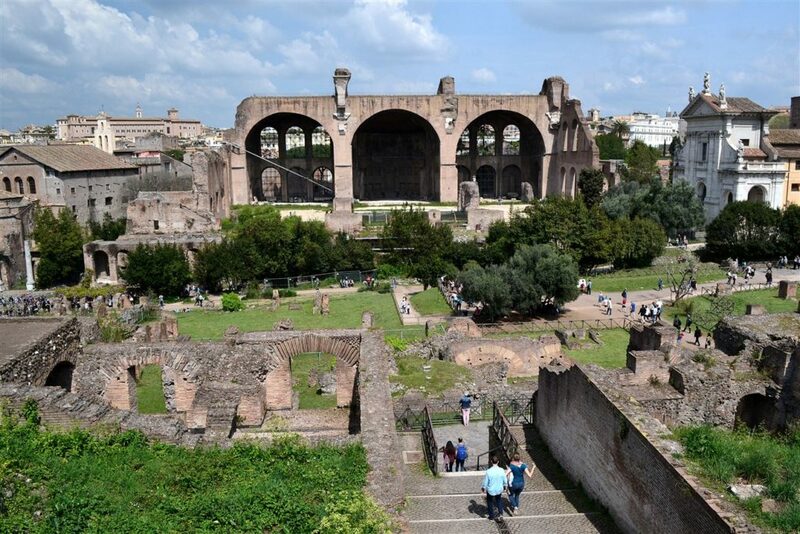 The Forum is a sprawling, rectangular site located in a valley between the Palatine and Capitoline Hills with the Colosseum at the east end, and surrounded by the ruins of several important ancient government buildings. 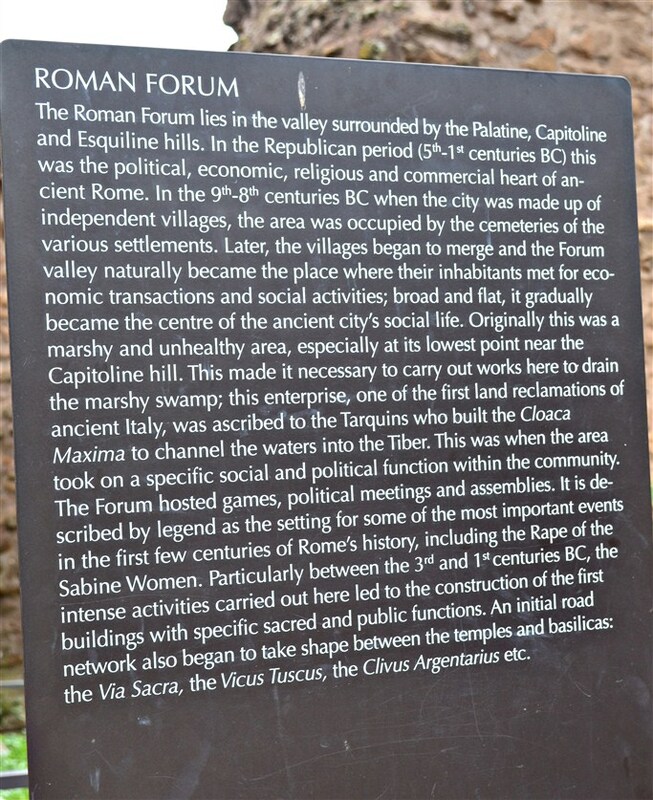 Citizens of ancient Rome referred to this space, originally a marketplace, as the Forum Magnum, or simply the Forum. 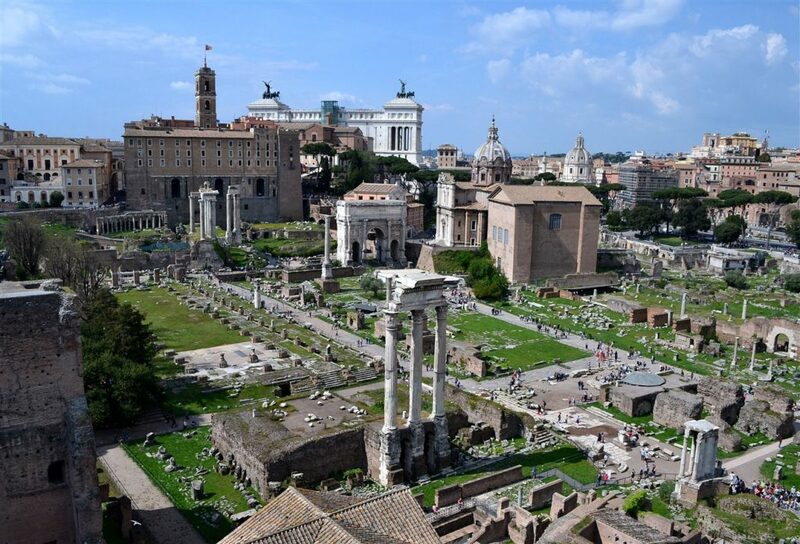 For centuries this was the epicenter of Roman public life: the site of triumphal processions and elections, public speeches, criminal trials, and center of commercial affairs. 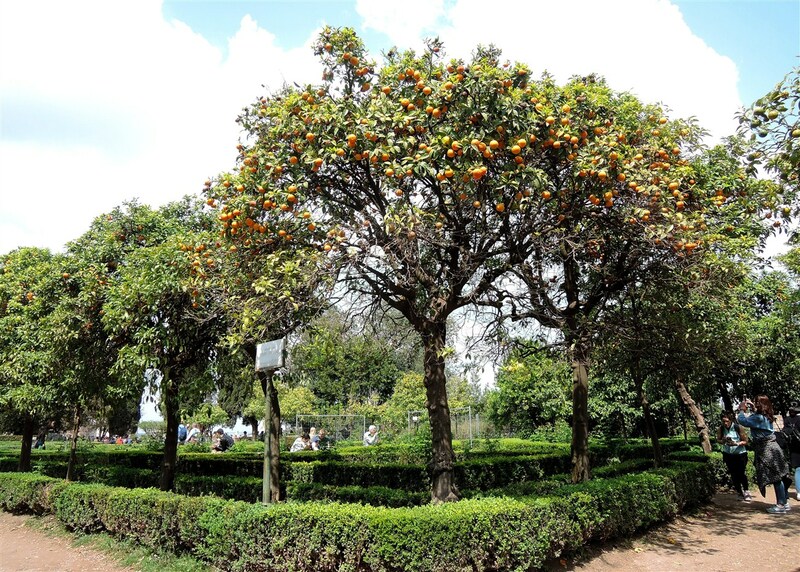 Statues and monuments were erected here commemorating the city’s great men and military triumphs. The heart of the city, it has been called the most celebrated meeting place in the world, and in all history. 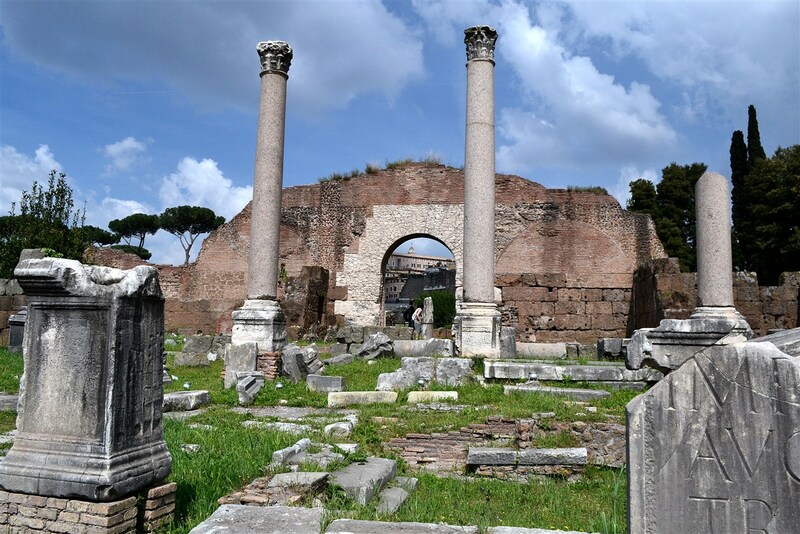 Today the Forum is a vast ruin of architectural fragments and occasional archaeological excavations attracting 4.5 million sightseers yearly. 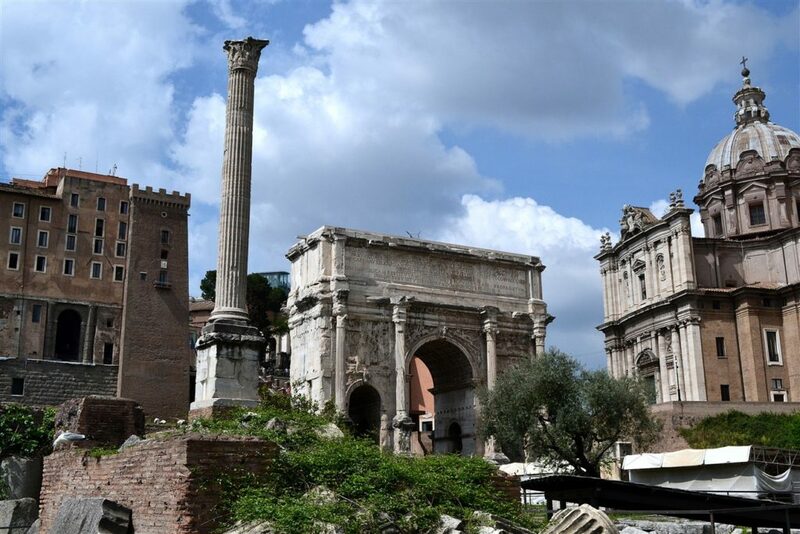 Many of the oldest and most important structures of the ancient city were located on or near the Forum. 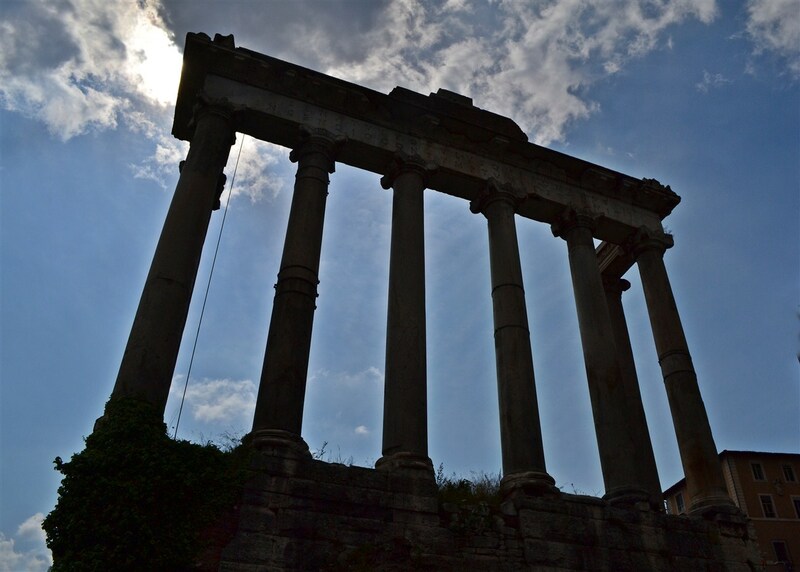 The Roman Kingdom’s earliest shrines and temples were located on the southeastern edge. 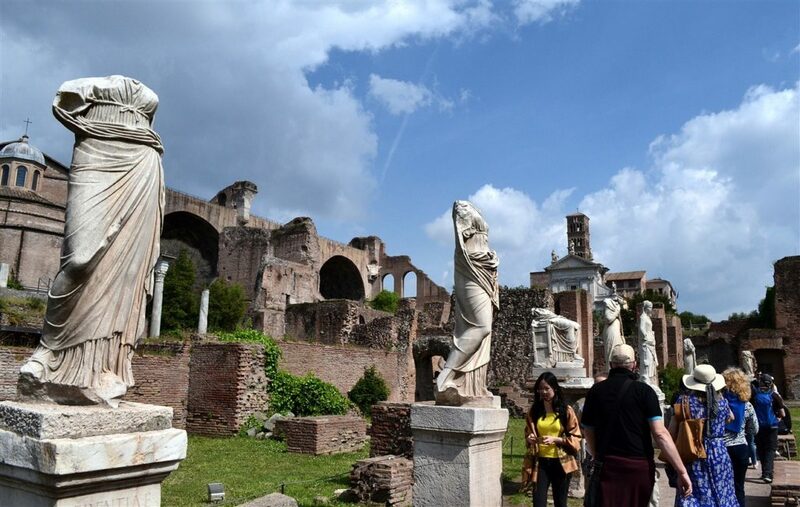 These included the ancient former royal residence, the Regia (8th century BC), and the Temple of Vesta (7th century BC), as well as the surrounding complex of the Vestal Virgins, all of which were rebuilt after the rise of imperial Rome. This is also where the Senate – as well as Republican government itself – began. The Senate House, government offices, tribunals, temples, memorials and statues gradually cluttered the area. 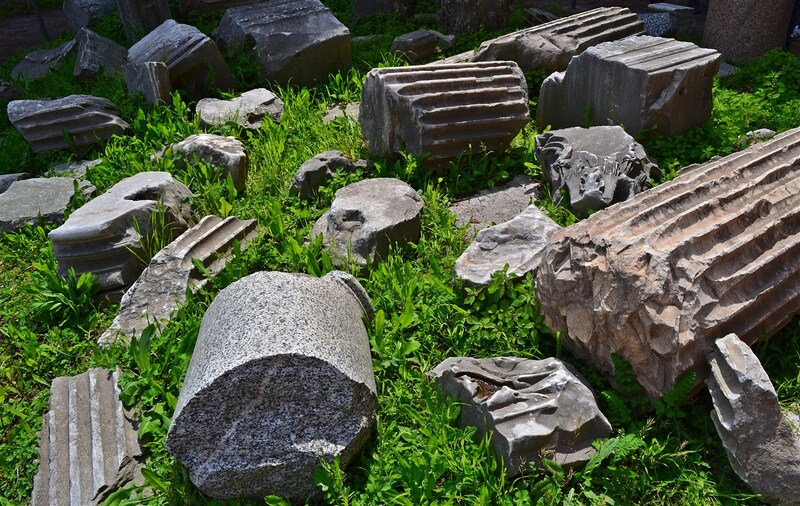 What all this means to the modern day visitor is the Forum may be the most concentrated collection of ancient artifacts and ruins anywhere in the world. You literally cannot walk ten feet without stumbling over a chunk of marble or a fallen column or the entrance to some temple or archway or monument. They range from the fairly well-preserved. 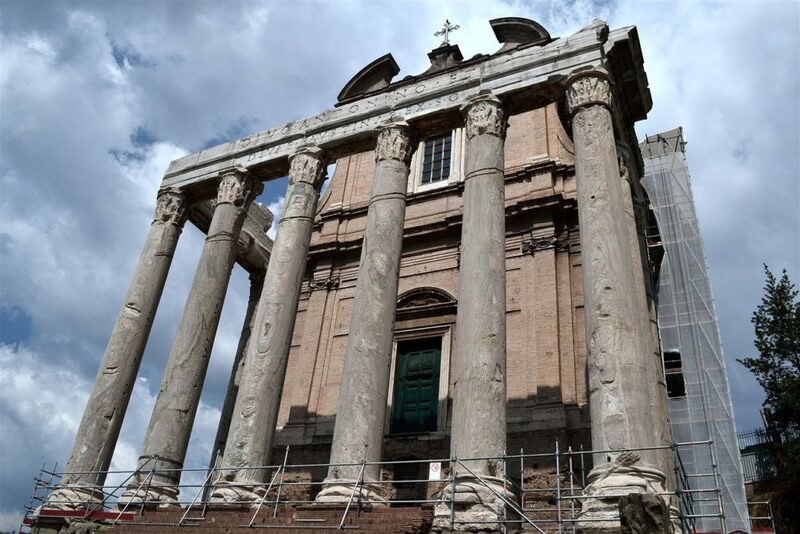 such as the Temple of Antoninus Pius and Faustina, to the barely recognizable skeleton of the Temple of Castor and Pollux, now nothing more than three standing columns (though they are photogenic). There’s an awful lot to take in here and in retrospect, I have to admit this is one spot where a knowledgeable guide would be very useful if you want to get the most information and historical understanding from what you’re looking at. We did not have one and while it was still an amazing and thrilling place to be in, I think a guide here would be a definite enhancement to your visit and give you the optimal bang for your buck. Could we take one of these chunks home for the garden? Hmm…is there something missing on these statues? 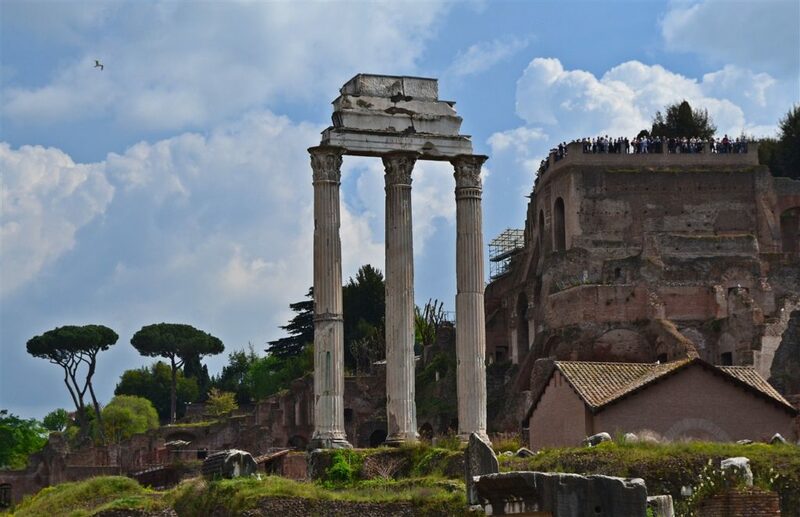 Again, like all the famous sites of Rome, the Roman Forum lives up to its reputation and really is a can’t miss stop on your Roman itinerary.